The hot springs of Pozar are situated just 13 km far from Loutraki and 25 km from Edessa. It is a natural spring of hot water among huge trees with a stream that descends into the gorge creating a hard sound of water and steam in the air. The resort facilities are a small spa with hotels, restaurants, swimming pools and locker rooms, offering guests high quality service. In Pozar you can enjoy the water by specially formed swimming pools or in one of the baths. The large outdoor pool is ideal for diving during both winter and summer. There are two spas with 48 individual baths, 2 indoor pools and 2 individual steam rooms with capacity of 6 persons. Since 2005, a new spa operates with 6 individual pools and artificial waterfalls. 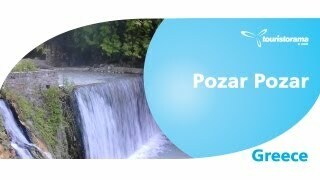 Pozar is a destination for those who want to combine contact with nature, relaxation and the benefits of hydrotherapy. It is no coincidence that more and more people embrace the belief that 10 baths per year give strength to the body.